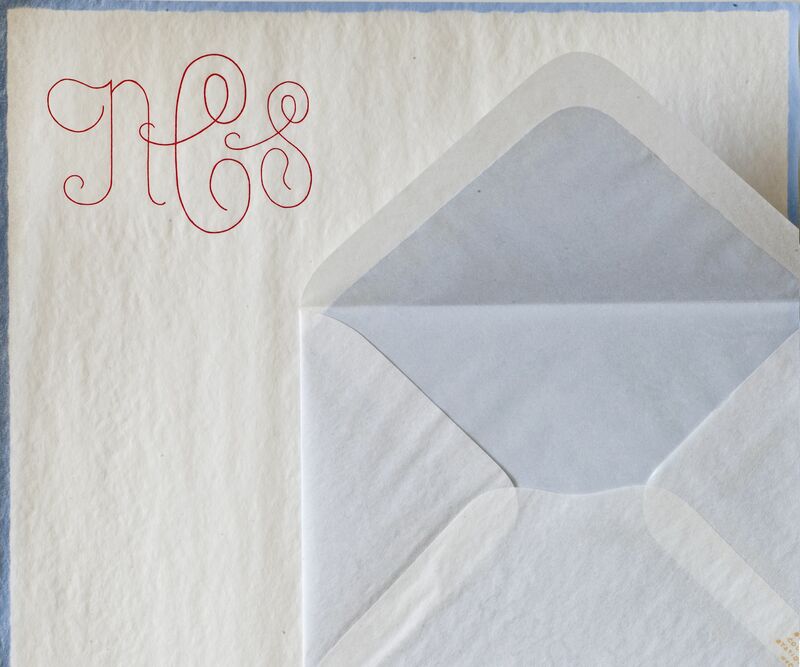 Pantograph and hand engraved cipher on proprietary onion skin letter sheets with hand made, fully lined onion skin envelopes exclusively from Nancy Sharon Collins. Our process for creating the perfect piece of stationery is much the same as creating a brand identity. Once commissioned, the client is brought through a series of interviews and questions similar to what is used in branding research. This investigation discovers the core visual representation of who you are and how you wish to be perceived. Remember, when someone receives a note, calling card, or letter from you, you have one shot to make that perfect impression. We look at a lot of reference material, historic and contemporary. We talk a whole lot, and/or we exchange emails sharing photos and images from the environment, museums, magazines, blogs…etc. We look at colors for ink and papers. All ink but black is mixed by hand and to eye, matching as closely as possible a target color. We stock only a few select papers. All other papers we strive to find to match the client’s taste. While it is impossible to source and import every paper—with some exceptions—if a given paper is commercially distributed in the United States, we can usually provide it. A client may choose from our own distinctive #9 onion skin (photograph at right), “Oh That Pink” signature paper, or super-thick, 100% cotton museum board. Clients may also be encouraged to source and purchase paper on their own. In this case, we guide them through these choices, quantities, shipping, and handling—paper is extremely delicate and should be handled with great care.